Early bird discounts end 1/31! Purchase your discounted tickets today using the code SneakPeek at checkout. This year's festival builds on the incredible momentum from our first year to bring you two days of thought-provoking conversations and innovative thinking, tackling the most important issues of our times. Be there when journalists, politicians, authors, and newsmakers from our community and around the nation come together to take a hard look at the people, policy and events that shape our lives. Crosscut programming explores the fabric of our cultural conversation across a wide swath of subjects. Sessions will include programming in tracks including Keynote, Race & Social Justice, Politics, Business, Science & the Environment, Interactive Workshops, Meetups, plus live music, food, drinks and social events. Last year we welcomed more than 80 speakers including former Secretary of Housing and Urban Development Julian Castro; WA State Governor Jay Inslee; OR State Governor Kate Brown; Attorney General Bob Ferguson; Seattle Police Chief Carmen Best; former Presidential speechwriters David Frum and David Litt; and many more! Our program for the 2019 Festival is shaping up to be even bigger! The first round of speakers will be announced in early January on the Crosscut Festival website and Facebook page. Get your tickets early for the best rate, and join us this spring at Seattle University! Volunteers are able to attend all Saturday activities (for free!) 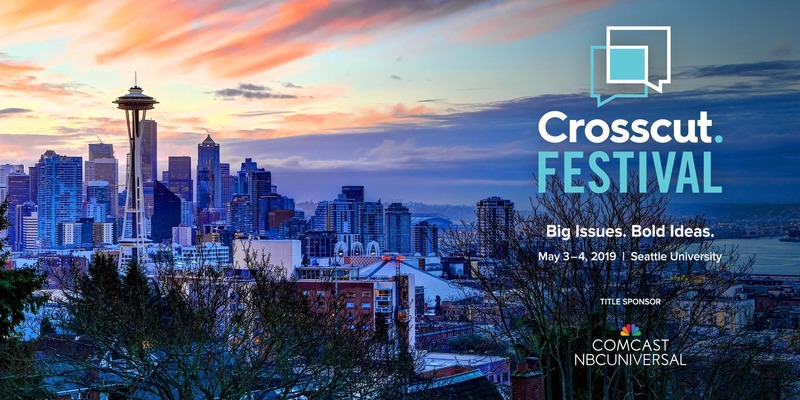 outside of their scheduled hours - and you'll receive a free Crosscut Festival t-shirt! Interested? Click here to sign up today! More information and a full list of last year's speakers available at festival.crosscut.com.